IOWA CITY, Iowa (AP) — Nebraska fired coach Bo Pelini in part because beating Iowa wasn’t good enough. The Huskers canned his replacement, Mike Riley in part because they weren’t good enough to beat the Hawkeyes. New coach Scott Frost will get his first crack at Iowa on Friday in a border rivalry that’s blossomed into something of annual referendum on both programs. The Hawkeyes (7-4, 4-4 Big Ten) snapped a three-game losing streak last weekend with a cathartic 63-0 whitewash of Illinois on the road. Nebraska (4-7, 3-5) has won four of its last five after a 0-6 start and would like nothing more than to enter the offseason with a win at Iowa. The Hawkeyes have won three straight over the Huskers, including a 56-14 blowout in Lincoln a year ago that helped seal Riley’s fate. Iowa’s seniors will try to make it a clean sweep of Nebraska, which has lost the last two in the series by 30 and 42 points. After losing to Penn State, Purdue and Northwestern by just 12 combined points, the Hawkeyes exploded for nine touchdowns against the Illini. Iowa scored in nearly way imaginable, racking up touchdowns on runs, passes, a fumble return and a punt return. “I’ve certainly watched them enough to know that they’re really good on offense, I’ve been impressed. I think they’re more multiple than they used to be,” Frost said. 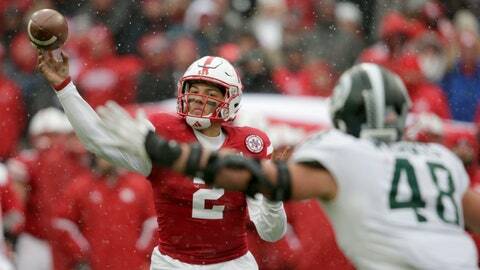 The Hawkeyes know that they will have to be wary of Nebraska quarterback Adrian Martinez. He needs just 90 yards of total offense to become the first freshman in school history with 3,000. Iowa has pitched a pair of shutouts, and the Hawkeyes held four other opponents to 14 points or less. The Hawkeyes rank ninth nationally in scoring defense at 16.5 points per game and will likely be the toughest unit Nebraska has seen outside of Michigan, which beat the Huskers 56-10. Last week’s win was the 150th for Ferentz at Iowa. Ferentz also won 12 times at Maine. … Nebraska leads the series 10-7 in games played in Iowa City. … Iowa leads the Big Ten with 17 interceptions. … Nebraska’s Stanley Morgan Jr. needs just 24 receiving yards to set the school’s career record. … The Hawkeyes are 12-3 in their last 15 trophy games. All three losses in that span came against Wisconsin. “His sustained success is impressive, but you still don’t get to 150 unless you’re a little bit old. I’ll make sure I remind him of that when I see him.” — Frost about Ferentz.